This is the best one I have tried so far! I didn’t have to search long for what I consider to be the best homemade dough out there. I love that it makes a huge four pound batch of dough because I portion the dough out into 16 ounce balls and freeze them to use for the next few weeks. It comes together easily, is tasty and economical – always a bonus! I have to use my giant 6 quart lidded containers to let it double in – those were a great buy. I found them at Sam’s Club in the restaurant supplies section. I have been eyeing some other items there…so tempting! I love shopping for kitchen supplies – I just wish that we had more money to blow on new toys for me…hey, those are the kind of “toys” that benefit everyone. Our eight year anniversary is coming up, so maybe I will be able to get some things that I wouldn’t normally justify;o) Anyway, enough rambling on about that – here’s the recipe! The directions that Jamie Oliver gives are for hand kneading the dough. I use my standing mixer, so I will tell you how I make it. Thanks for reading, enjoy! If you’re using active dry yeast, get it started proofing in about 1/2 cup of your lukewarm water, all the raw sugar and extra virgin olive oil. While waiting for the yeast to wake up, measure out all your dry ingredients – by weight for the flour is best, then combine them in a large mixer bowl. Measure out 2 cups of lukewarm water, I always use bottled from our water cooler because of the added chlorine in tap water . Add the proofed yeast mixture and the 2 cups of water to the flour. I stir the mix with my dutch whisk, (you can use your hand or a wooden spoon) then once I have formed a rough dough, I hand knead for about a minute until it becomes a little smoother. Using your standing mixer with the dough hook, knead the dough for 5 to 7 minutes on low until the dough is smooth and springy. 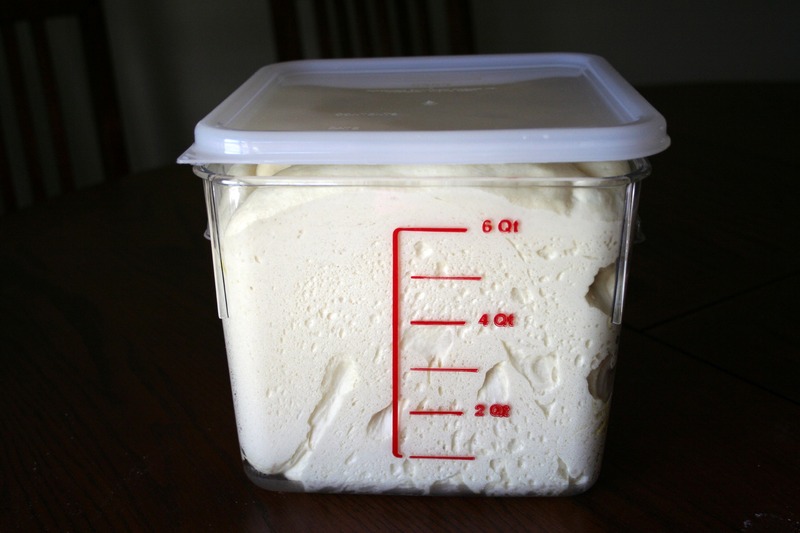 Place the kneaded dough in a large, lightly oiled container to rise, then lightly cover the container. Let rest until doubled in bulk – about 1 hour. Weigh and divide the dough as needed. I use Ziploc quart sized bags with a little extra virgin olive oil poured in to prevent sticking. It’s also helpful to write the date and weight of the dough on the bag.